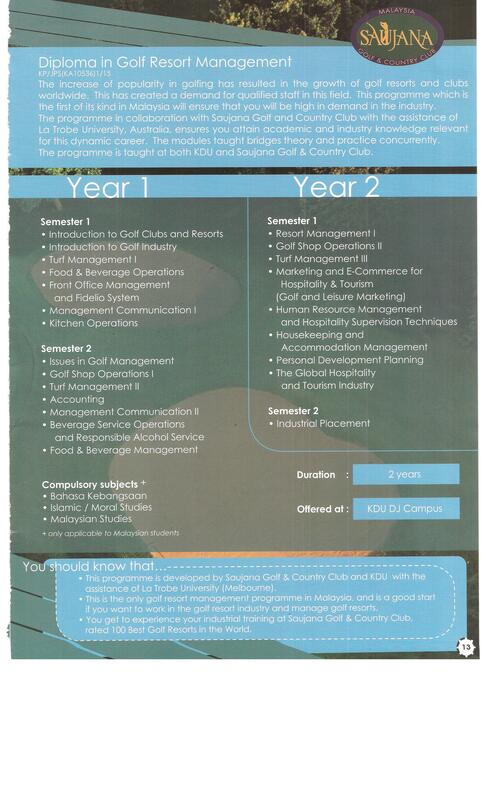 I’ve been going through a booklet provided by KDU University College, Hospitality and Tourism faculty which is providing a Professional Certificate in Golf Resort Management that will take 2 semesters to complete and a Diploma in Golf Resort Management that will take 2 years. It seem the students will learn about almost everything in the golf resort; from Front Office, Kitchen, Accounting, Housekeeping, Golf Shop and even Turf Management. I am an18-year veteran in the industry and I don’t even know what a Fidelio system is! They are learning it as one of the Front Office Management subjects. I guess it won’t be long before a bunch of these graduates will be making dinosaurs like me extinct. I mean, for the Turf Management subject, they are learning about designing a golf course, permits/licenses/approvals to build a golf course, philosophy of golf course maintenance, installation of the irrigation system, pest, diseases and even the golf cart paths. Phew… I don’t know about the rest of you guys out there, but there is a lot more that I need to learn here. 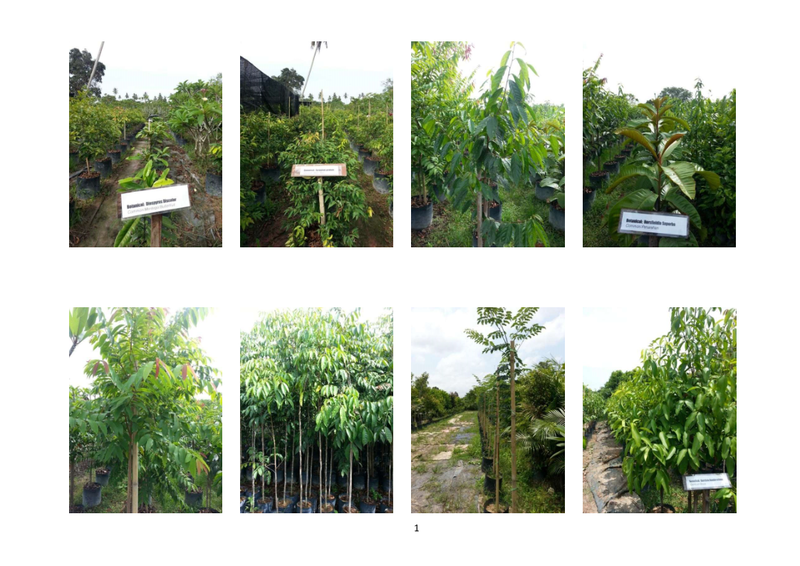 To top it all, the programs are designed in collaboration with Australia’s La Trobe University and Saujana Golf & Country Club! I suppose we should not tell the public about this Certificate and Diploma, lest the graduates take away our jobs. We should not let the youngsters out of school know that there will be a demand for more professionalism in the industry soon and 5 – 10 years in the future, paper qualifications are as much a necessity as experience. We should keep it a secret that we are getting old and there is not that many second-liners qualified to take our place. Maybe we should not allow the more ambitious among us to enquire about this course and – God forbid – take the course to further their career. I mean, imagine, someone with 5 year experience, then suddenly he take time off from work to get a certificate or diploma in golf resort management; he is going to teach the boss what to do and (oh my God) be next in line for the boss’ job! Certificate to a better career. What about the young golfers or pros? Better not let them know too. 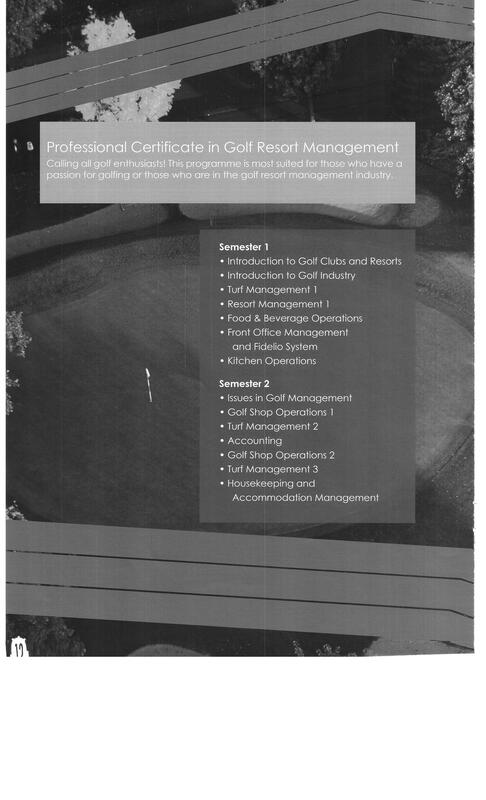 Shudder… Professional golfers with professional golf resort management qualifications? Mana orang lama mau cari makan? Lets give them more complimentary green fees so they won’t think of study so much. Its agreed then. We won’t tell anyone that KDU Damansara Jaya campus is at SS22/41 and their contact number is 03-7953 6688 or that their email is best@kdu.edu.my and website http://www.kdu.edu.my. Lets keep it our secret. This entry was posted on March 25, 2011 at 7:25 am	and is filed under Padang Golf. You can follow any responses to this entry through the RSS 2.0 feed. You can leave a response, or trackback from your own site. I like your view, damn funny ….